Some days you have it. Some days you don't. And some days you watch your mentor give his life up to give you a fighting chance and respond by nearly getting yourself killed through your own stupidity. It must be mentioned that if Joe hadn't stepped on Mimi's heel, the entire group would have died in a fire. No... this isn't going down as one of their better outings. It starts out rough, as the digidestined watch from a distance as Piximon dies, landing on a familiar strip of seafront property. Yep, they're back on the beach of random payphones, only the payphones are all smashed up and Shellmon summons the kids out to water this time. The kids, after just having their lives spared by Pink Yoda, immediately put themselves at risk again by responding to a dubious distress signal in an outrigger canoe without their Digimon. The lesson here should have been that the kids are still prone to stupid mistakes. 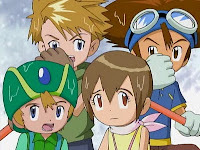 Instead, Tai harps on the fact that the Digimon were able to save the day at Rookie level. To us, it's a wasted effort as we still had four In-Training-to-Rookie evolution sequences, but it's nothing compared to last episode. Still, it's mild encouragement and I guess as leader he's supposed to say stuff like that. It doesn't change reality, however, as the team promptly gets suckered into yet another trap promising free food. It's not even a fancy banquet or cruise ship this time, just a crappy beachside grill. But the smell is too tempting and they all float towards it, with only Joe's clumsiness keeping himself and Mimi out of it. Everybody else is trapped inside, where Scorpiomon knocks them all out with a sand attack... which is probably a lot more agonizing than they make it look. Scorpiomon is pretty amusing. He works for clams, doesn't want to put too much effort into his work, and openly complains when Joe and Mimi are more elusive than the others were. They lead him on a slow-speed chase before he finally gets tired and leaves. He doesn't return until Gomamon and Palmon start eating his clams. Then it's personal. And for all the talk about the Digimon getting stronger, it takes both Ultimates to bring him down. MetalSeadramon, meanwhile, is not a complete dolt and realizes that Scorpiomon's taking way too long with all this. So he's going to go on ahead and light up the grill. Joe and Mimi scramble to wake everybody up and get them out of there just before the place burns down. Once everyone's safe, they throw in the unconscious Scorpiomon. This, incidentally, has to go down as one of the most disturbing and unnecessarily cruel acts ever committed by the good guys, especially when you consider that Scorpiomon's only in it for the clams. That's the kind of behavior that kept the first season of Yu-Gi-Oh from going stateside. The idiocy parade continues. After Joe and Mimi report that no, their Digimon aren't really all that stronger, MetalSeadramon shows up to prove it. Lillymon tries distracting him while the others escape. This succeeds, but unfortunately their “escape” consists of everybody hopping on board Zudomon and swimming further into MetalSeadramon's territory. 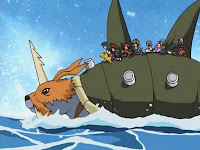 The rest is predictable: MetalSeadramon takes care of both Lillymon and Zudomon and the kids are stuck bobbing in the ocean waiting for him to strike. The sound you are now hearing is Piximon repeatedly smashing his head against the inside of his digiegg in Primary Village. Sometimes the dub throws in random lines just to see if it gets past the censors, like MetalSeadramon calling Scorpiomon a “chuckle-headed cockleshell.” It's not correct usage, but does sounds quite dirty. Scorpiomon's size seems to change over the course of the episode. He's small enough to fit inside the restaurant and doesn't seem much bigger than a typical Champion Digimon when chasing Joe and Mimi. Yet he towers over Ikkakumon and Togemon when he fights them, and those two are pretty large. Just wanted to pop in and say I've really be enjoying your blog entries. 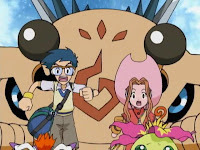 I'm really looking forward to the coverage of the Puppetmon episodes; I've always thought those ones were the best in the first season. Yeah, the kids were really not on form in this episode, as you point out. It doesn't look good when two laughable sea monsters get the drop on them within minutes of each other (Shellmon pretending to be a drowning victim, and Scorpiomon ambushing them in the grill). At least Scorpiomon was one of the funnier minions, to the point where I wish he wasn't axed off by MetalSeadramon at the end. That said, MetalSeadramon could've flamed the six he had without waiting for the complete set, especially since most of the rest of the time, he's ruthlessly pragmatic with his "kill 'em all and be done with 'em" approach. Also, why was Shellmon randomly voiced here when last time, he was clearly animal-like in intelligence? They even change his vocals for the flashback, which only highlights just how weird it is. Lastly, you know your escape plan is stupid when your enemy mocks you for it seconds after noticing it: "Fools! You think you can escape me by sea!?"